Fillerina is the first generation of filling and plumping treatments: it works in such a way as to be presented as a cosmetic filling treatment for at-home use for face, neck and décolleté (expression lines, age wrinkles, depression areas on the skin) and for the volume of cheekbones and lips. 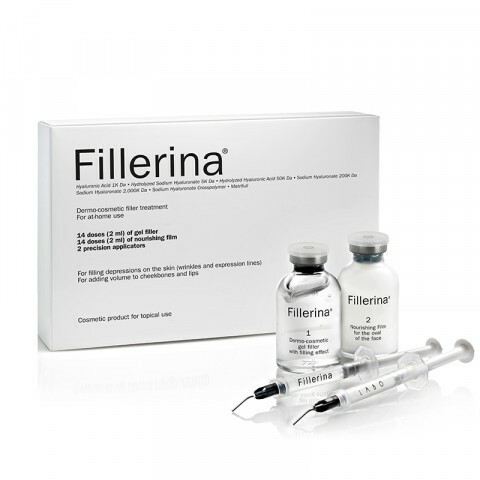 Fillerina is the first generation of filling and plumping treatments: it works in such a way as to be presented as a cosmetic filling treatment for at-home use for face, neck and décolleté (expression lines, age wrinkles, depression areas on the skin) and for the volume of cheekbones and lips. 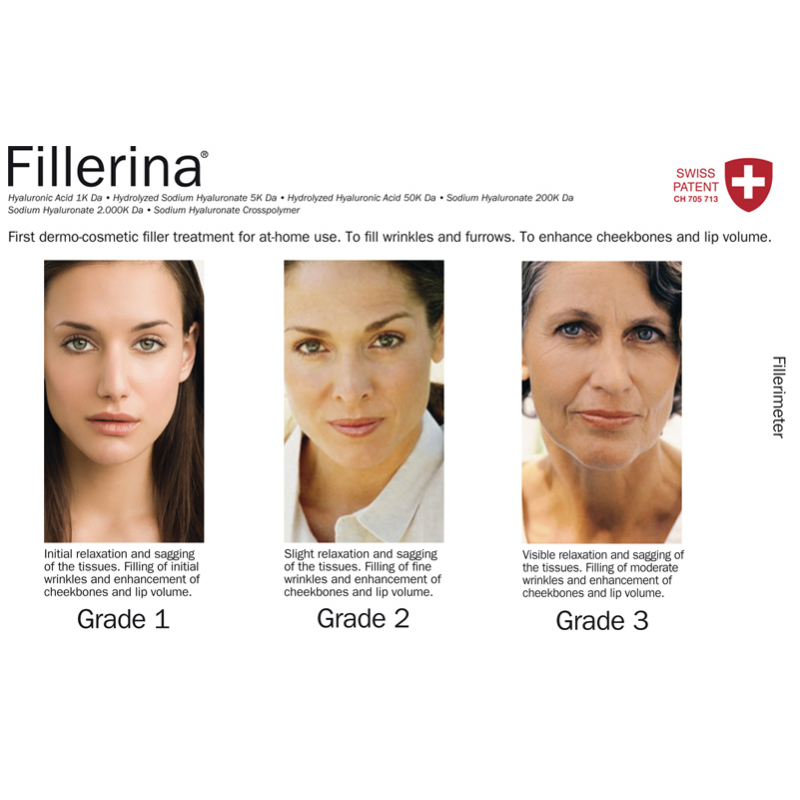 Fillerina comes in three different concentrations, in order to provide the most effective, suitable treatment for the conditions of the skin and the cutaneous tissues of the face and neck. It is composed of the Gel Filler (Fillerina 1), with a high content of immediately absorbed hyaluronic acids, and the Nourishing Film (Fillerina 2), to be used after the Gel. Clean the face and, by means of the special Applicator with truncated tip, draw up two separate 1 ml amounts (up to a total of 2 ml per application) of Gel Filler and release it directly on the wrinkles, on the most marked microrelief and on those areas that particularly need to be plumped up (cheekbones, lips). Relax for 10 minutes: the gel should stay in place in order to let the active ingredients «fill in» the areas where it has been applied. Do not perform any massage or rotating movement so that to prevent the formation of residues at surface level. 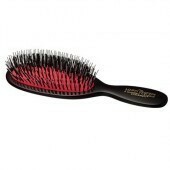 After 10 minutes, pat the product with your fingertips. With the palm of the hands, perform a slight pressure until the skin will be completely dry. The residues that appeared following wrong massage or friction movements can be absorbed by performing a simple pressure with your fingers. Draw up 1 to 2 ml of Nourishing Film (Fillerina 2), according to your specific needs, and spread it all over face and neck. Let the emulsion be absorbed by means of a brief slight massage, without rubbing. It will dry by itself. To facilitate the action of the product, it is advisable to drink two glasses of water before the application of Fillerina Gel. Ingredients: Fillerina Gel: Aqua, Glycerin, Sodium Hyaluronate, Hydrolyzed Glycosaminoglycans, Caprylyl Glycol, 1,2-Hexanediol, Butylene Glycol, Sodium Hyaluronate Crosspolymer, Disodium EDTA, Hydrolyzed Hyaluronic Acid, Hyaluronic Acid, Tropolone, Hydroxypropyl Cyclodextrin, Hydrolyzed Sodium Hyaluronate, Pentylene Glycol, Ethylhexylglycerin, Palmitoyl Tripeptide-38, Acetyl Hexapeptide-37. Fillerina Nourishing Film: Aqua, Cyclopentasiloxane, Glycerin, HDI/Trimethylol Hexyllactone Crosspolymer, Polysilicone-11, C30-45 Alkyl Cetearyl Dimethicone Crosspolymer, Dimethicone, Steareth-2, Xylitol, Ammonium Acryloyldimethyltaurate / VP Copolymer, Butylene Glycol, Steareth-21, Limnanthes Alba Seed Oil, Hydrogenated Lecithin, Phenoxyethanol, Boron Nitride, Tocopheryl Acetate, Stearic Acid, Palmitic Acid, Benzophenone-4, Sodium Chloride, Diazolidinyl Urea, Parfum, Benzophenone-3, Lecithin, Allantoin, Pseudoalteromonas Ferment Extract, Xanthan Gum, Butyrospermum Parkii Butter, Silica, Alcohol, Disodium EDTA, BHT, Cyathea Cumingii Leaf Extract, Limonene, Linalool, Sodium Hydroxide, Hexyl Cinnamal, Butylphenyl Methylpropional, Geraniol, Citronellol, Caprylyl Glycol, Arginine, Salicylic Acid, Coumarin, Citral, Acetyl Hexapeptide-30.